Japanese fire belly newts (Cynops pyrrhogaster) are small to medium-size amphibians, usually measuring between 3 1/2 and 5 1/2 inches. These newts' life expectancy varies depending on whether they're wild or captive. Predatory threats keep the average longevity of wild newts limited; Captive newts have much better chances of making it to old age, particularly those well cared for. 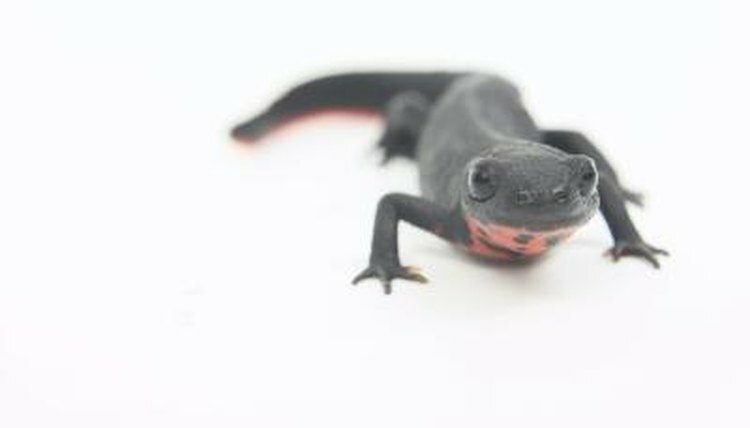 As their name suggests, Japanese fire belly newts are native to Japan. They live on the islands of Honshu, Shikoku and Kyushu, where they can be found in ponds, paddy fields, pools, streams and brooks. They have distinctive coloring; their backs are chocolate-brown to black; their undersides are bright red, in spots, lines, blotches or other markings, depending on the individual. There are six distinct subspecies, each with slightly different coloration and morphology. In captivity, Japanese fire belly newts tend to live 10 or 15 years but can live for up to 30; some live even longer. You can hope to extend life span by giving them proper care and attention, so be sure you understand and can facilitate one of the creature's needs before taking one on. Their relatively long lives should give you pause if you can't commit to long-term care. It's hard to determine the exact life span of Japanese fire belly newts in the wild; scientific research and observation is lacking. Experts believe they can live for up to 25 years if they make it into old age. However, certain threats in the wild can stop these creatures from reaching their full potential. A range of threats can shorten Japanese fire belly newt life span. Predators are always a problem, especially when the newts are in their larval form, at which time they're considered prey by many fish. In addition, they've suffered some loss of habitat as paddy fields are abandoned or as small paddy fields are converted into large-scale ones. Fire belly newts can get caught up in and killed by roadside drains.